. : Farm Forest Line - Landcare and Rehabilitation :. 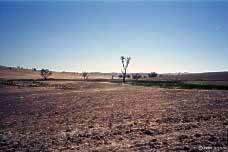 Soil erosion, dryland salinity, exotic weeds, soil nutrient decline and other forms of land degradation cost Australian farmers millions of dollars every year in lost productivity. The cost to the wider community in terms of reduced water quality, damage to infrastructure and the loss of our natural heritage is impossible to estimate. Strategic revegetation of deep rooted perennial trees and shrubs is commonly seen as the most cost effective means of controlling land degradation at its source and restricting its spread. The key to using revegetation to combat land degradation lies in understanding the processes that cause and increase the problem. This provides a basis for determining how trees and shrubs might be used to halt or slow the process. For example, wind erosion can only occur on a ploughed field if the force of the wind is sufficient to detach and carry soil particles. Soil type and clod size, soil moisture, width of the ploughed field and wind speed are all important factors in the process of wind erosion. By understanding how trees reduce wind speed, farmers may be able to design a shelterbelt network across their farmland that can virtually eliminate the risk of wind erosion while minimising the impact of trees on agricultural productivity.